FORMER GARDA COMMISISONER Martin Callinan has said that the former head of the garda press office David Taylor told him he wanted Callinan “involved” in efforts to “bring down” Nóirín O’Sullivan. He also disagreed with the claims of an RTÉ journalist that he described Maurice McCabe of having done “horrific things” and had “psychological problems”. Callinan was giving evidence for the first time at the Disclosures Tribunal, where it has been claimed he ordered a smear campaign against garda whistleblower Maurice McCabe. This week, Superintendent David Taylor has given evidence at great length alleging that Callinan told him to tell the media that McCabe was driven by “revenge” against the gardaí. Furthermore, both Taylor and former PAC chairman John McGuinness TD have both testified that they heard Callinan refer to McCabe as a “kiddie fiddler”. Callinan denies ever ordering a smear campaign against Maurice McCabe, and statements were read out from him today saying “there was no justification in any shape or form” for the allegations being made by Taylor. Fairly quickly, he was asked about his attitude to Sergeant Maurice McCabe. Callinan said that he was aware of the 2006 sexual abuse allegation but didn’t have the file, but told the Tribunal he could have accessed it. He said that he heard an allegation had been made, a file had been sent to the DPP, and he “didn’t concern himself with it afterwards”. The DPP had completely exonerated McCabe of wrongdoing in the affair. Callinan told the Tribunal that around the time that Maurice McCabe was whistleblowing over the penalty points scandal, there was a “strong suspicion” as to the whistleblower’s identity. Callinan also said that David Taylor visited his home after the former press officer was arrested in 2015. He claimed that Taylor blamed Nóirín O’Sullivan for his arrest, and that he had a “grudge” against her over that matter and also for being moved “sideways” out of the press office. Callinan said that Taylor said he wanted to “bring down” O’Sullivan and that he wanted to “involve” Callinan in the process for it to be successful. The former commissioner said that he never felt that Taylor had a grudge against him and denied all of the allegations Taylor has made against him, saying “there was no justification for it in any shape or form”. One of those who alleges that Callinan told them negative things about McCabe is RTÉ journalist Philip Boucher-Hayes. He alleges that Callinan told him that McCabe has “psychological issues” when the commissioner came in to appear for the Christmas edition of Crimecall in 2013, as the head of the gardaí customarily does each year. It is Boucher-Hayes’ case that he wanted Callinan to face questions over the penalty points issue, but that Callinan’s team refused to do so. He told me that McCabe was a troubled individual and that he had a ‘lot of psychological issues and psychiatric issues’. He claimed that McCabe was motivated by a set of grievances against Garda management and that he was famous within An Garda Síochána for this. He warned me that McCabe was not to be trusted and went on to add that there were other things he could tell me about him ‘horrific things, the worst kind of thing’, but that he did not elaborate further. Another new detail that came out today was the visit of a number of gardaí to the home of the uncle of Maurice McCabe during the time of the internal garda review into penalty points. Callinan says he wasn’t aware that this had happened. He was also asked about his “disgusting” comment at the Public Accounts Committee in January 2014. Callinan said that his remarks were taken out of context, and he meant the comment to refer to how matters had made into the public domain were disgusting. He said: “It was a very strong word to use. That was my position then and, unfortunately, that’s the way things are. Sergeant McCabe rightly reported what he saw to be wrongdoing. He was proven to be correct on a large amount of criticisms that he did raise. I’d be the first to acknowledge that Sergeant McCabe identified weaknesses in the system. I’d be hypocritical to come in and say otherwise. Callinan was also asked about his response to an article that was published alleging that he had had penalty points wiped from his licence, that was written by Gemma O’Doherty in the Irish Independent. He said that the article was “factually correct” and that he had been spotted speeding while on duty, but that he was driving to attend an urgent matter. Callinan ordered Taylor to make contact with publishers INM to express his annoyance over the story, particularly that O’Doherty had visited his home while he was not there prior to its publication. They may well do, but that was my reaction. I wanted to protest that a journalist was calling at that hour to my home when I was away. I was entitled to make that protest. Taylor subsequently met with the managing editor of INM to express this “annoyance” that Callinan felt over the story. The former commissioner was also asked about his contacts with solicitor Gerald Kean today. It mainly centred on an appearance from Kean on the RTÉ’s Marian Finucane show, around the time that the penalty points issue was at its peak in January 2014. During the show, Maurice McCabe rang to complain that Kean was making derogatory comments about him. Phone records show that Kean had lengthy discussions over the phone with Callinan a day prior to the show. 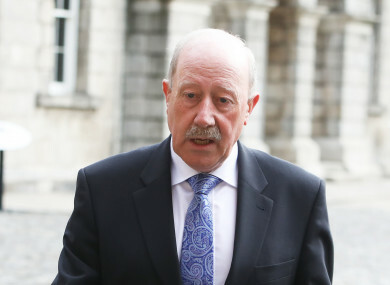 Callinan admitted today that it was “inappropriate” to engage with Kean on the issue of the penalty points issue, but said that he answered a number of questions from the solicitor about the internal garda review into the matter. Furthermore, after McCabe wrote to Kean to complain about the statements he had made on the show, Kean forwarded this correspondence to Callinan and asked him to check a draft he had made in response for factual accuracy. Callinan said that engaging on this topic wasn’t his “finest hour”, and in hindsight, he wouldn’t have gotten involved. The Tribunal is due to hear from Martin Callinan again on Monday, Tuesday and Wednesday of next week. Email “'He told me McCabe was a troubled individual and had a lot of psychological issues and psychiatric issues.'”. Feedback on “'He told me McCabe was a troubled individual and had a lot of psychological issues and psychiatric issues. '”.